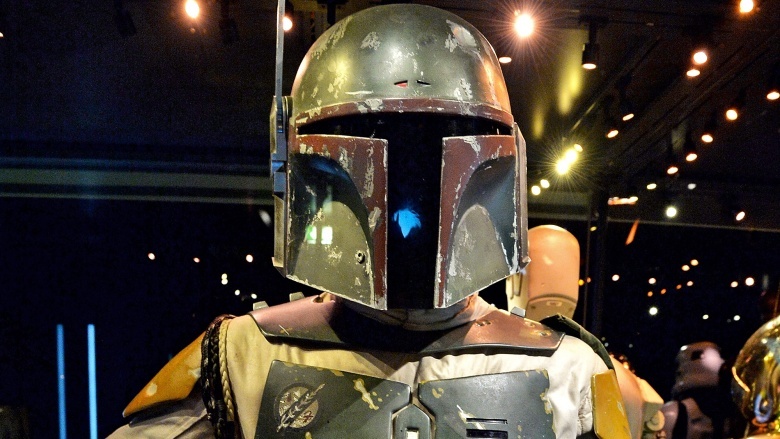 When it comes to popularity versus screentime, there may be no bigger winner than Boba Fett. For decades, fans have been fervently buying action figures, comics, and novels, despite the fact that in The Empire Strikes Back, he's only onscreen for about six and a half minutes and has a whopping four lines of dialogue—and in Return of the Jedi, he mostly looms in the background, having one cool fight sequence before being knocked into a giant pit by a blinded Han Solo. Most Star Wars fans are pretty secure about the origin story of their favorite bounty hunter—after all, everything is spelled out by Star Wars: Attack of the Clones. Boba Fett is the unaltered clone of legendary bounty hunter Jango Fett, who is raised as his son and eventually takes his own place in the galaxy as a bounty hunter after Mace Windu decapitates Jango. However, Star Wars had already developed a rich, extended universe of novels, comics, and games well before the prequels came around, and Boba Fett had a previous origin already laid out. Originally, his real name was Jaster Mereel, a man from the planet Concord Dawn. It was on this planet that he served as a kind of policeman (specifically, a Journeyman Protector) who killed his corrupt superior officers. He was charged as a murderer and kicked off the planet, eventually being taken in by the Mandalorians and becoming the character audiences love. After Attack of the Clones came out, the character of Jaster received a retcon and became an honor-driven Mandalorian (retaining most of his original origin of exile from Concord Dawn) who took a young Jango Fett under his wing after Jango's parents were murdered by the Death Watch, a group of fanatical Mandalorians. In a bit of irony, Jango's father had taken over after Mereel was exiled, mimicking the fact that Boba Fett's new origin replaced Mereel's original role. For those who only watch the Star Wars movies, Boba Fett's history seems very fragmented. He is only a part of one of the prequels and two of the original trilogy movies, with little explanation of what happened between witnessing his father's death and becoming the most badass bounty hunter in the galaxy. However, one source provides some interesting illumination on the young Fett's continuing adventures, and that is the Star Wars: Clone Wars cartoon. Clone Wars has the somewhat dubious honor of surviving the great purge of the original Star Wars extended universe. That universe had been building through various novels, comics, and games for years, and served as mostly canonical unless it was superseded by later movies (like Boba Fett's origin being dramatically different). On the eve of Force Awakens coming out, Disney clarified that none of these old extended universe stories were "official" anymore save for broadcast media, including Clone Wars. This means that unless something like the long-rumored solo Fett movie dislodges it, the Clone Wars continuity for Fett is official. The cartoon portrayed Fett as working with the Trandoshan bounty hunter Bossk and other shady characters such as Aurra Sing. 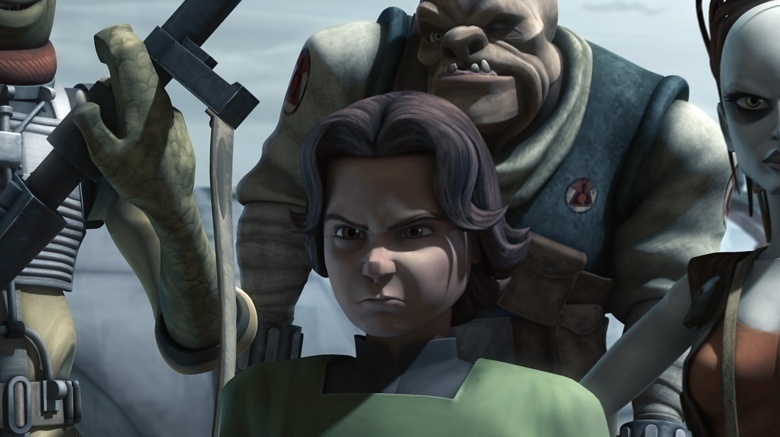 One of young Fett's understandable goals was to avenge Jango by killing Mace Windu, and he was imprisoned after failing in this task. However, the resourceful young warrior was able to eventually escape and go back to learning the ways of bounty hunting. Most people know that Boba Fett first appears in the film franchise in The Empire Strikes Back. Later in life he was digitally added to the original Star Wars and the really savvy fan may even be able to tell you Fett's first appearance on screen ever was during the Star Wars Holiday Special that aired in 1978 on CBS. But none of those are actually the first time the public got to meet Boba Fett. Boba Fett's first public appearance was, bizarrely enough, on September 24, 1978, at the San Anselmo County Fair parade. Who saw that coming? San Anselmo was the home of Lucasfilm at the time and George Lucas felt like having the characters in the local parade was a great idea. Duwayne Dunham was the man in the armor and also assistant film editor on both The Empire Strikes Back and Return of the Jedi. He recalls the day of the parade being insanely hot,­ and he was sweating buckets. But lots of people still wanted autographs even though they had no idea who he was. It's hard for Fett fanatics to even think about, but George Lucas had no idea that fans would make such a big deal out of Boba Fett. Lucas later expressed his surprise at this explosion of popularity for, as he puts it, "just another one of the minions" on the Return of the Jedi commentary track, admitting his regret that they didn't make a bigger deal out of Boba Fett's death. For some reason, Lucas really liked the idea of dudes in white armor. 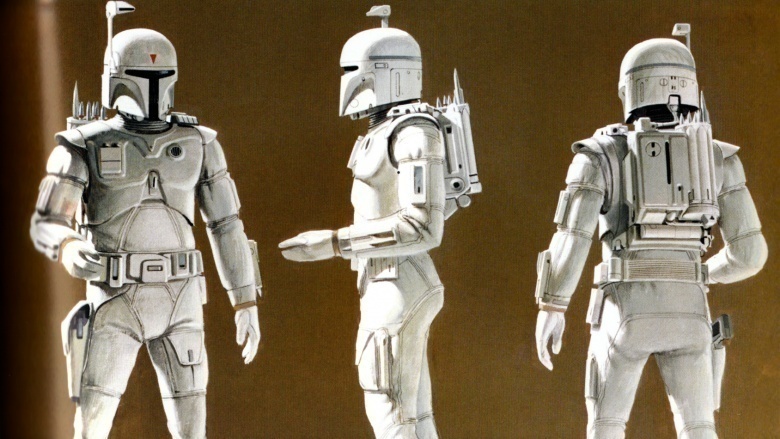 Stormtroopers in pearly white plates make up a huge portion of the original trilogy and Boba Fett was going to be no different if his original design—illustrated by Ralph McQuarrie—had been included. The features that made him look different than your average Stormtrooper were present—like a cool jetpack and a narrow and sinister visor—but it was all bright, shiny white. Why? Turns out he was supposed to be wearing ancient Stormtrooper armor, from a past regiment of the soldiers known as Shocktroopers. Basically he'd be a soldier in a civil war uniform during modern times. 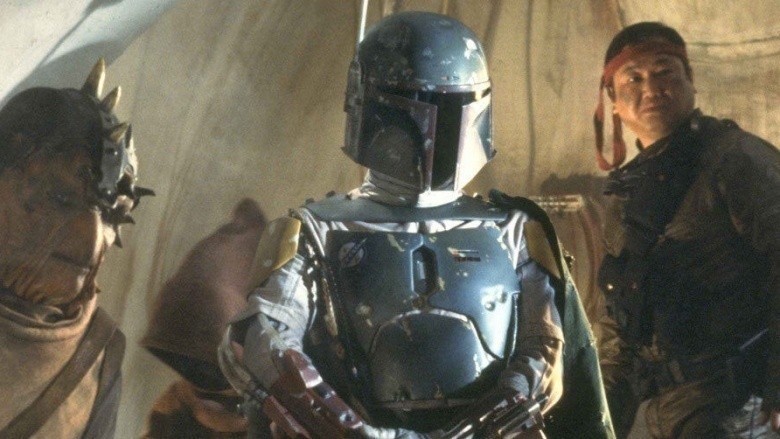 In fact, Fett was originally going to be Darth Vader, as a former intergalactic bounty hunter. As the character progressed to a fallen Jedi Knight, George Lucas moved the bounty hunter idea onto a different character, who then became the Fett we all know and love. For fans who have only seen the Original Trilogy, it would seem that Boba Fett and Darth Vader have a very amicable relationship. 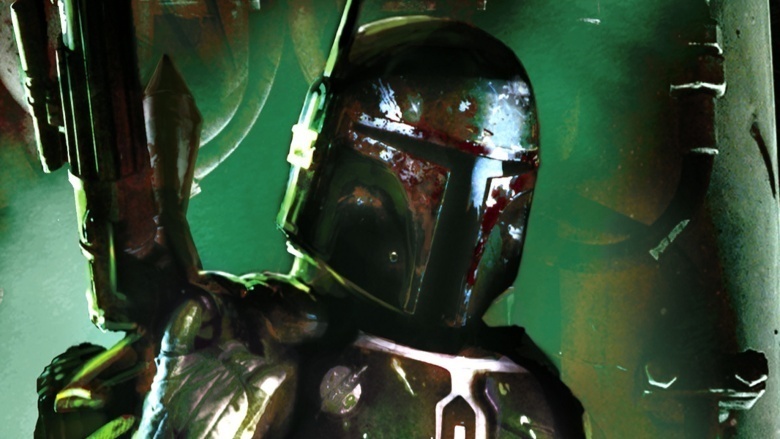 Fett seems to have status and a history with the Dark Lord as a kind of favorite contractor for the Empire. 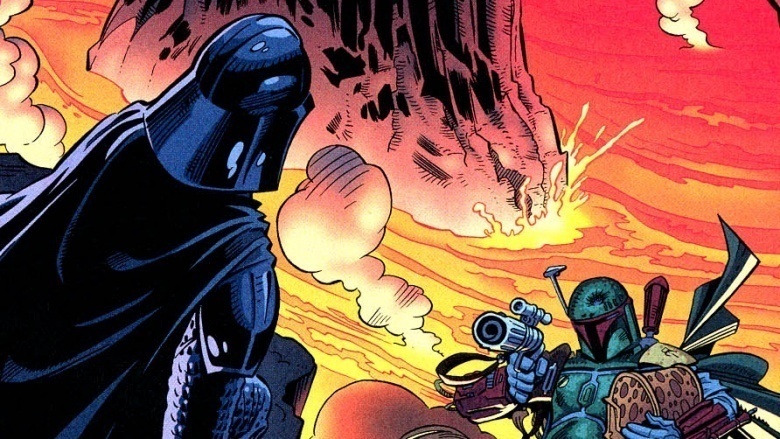 However, readers of the Star Wars comics over the years have witnessed the rather unforgettable sight of Vader and Fett trying to all-out murder each other. In truly bizarre comics fashion, the two were fighting over the severed-but-still-talkative head of an alien queen that was able to predict the future. Boba Fett was hired to retrieve this head in a box, while Vader wanted it as a tool for his eventual overthrow of Emperor Palpatine. The two came to blows, with Vader deflecting blaster bolts and cutting Fett's getaway speeder in half. Fett, in turn, fired much of his arsenal at Vader and even managed to shrug off an attempt at Sith mind control. Fett managed to non-fatally shoot Vader in the head, at which point Vader stopped screwing around and Force choked Fett. The only way he got out of it was by throwing the head in a box towards some nearby lava (you'd think Vader, of all people, would stay away from lava) and jetpacking to safety while Vader used the Force to retrieve it. It's not clear how the two went from nearly killing each other to a pleasant work relationship; perhaps they bonded over how difficult it is to go to the bathroom while wearing armor. You'd think Darth Vader would have taken the record for most actors portraying the same character from childhood through adulthood. But Boba Fett really wins that award since, for the most part, whoever fit into the armor got to play him onscreen. Jeremy Bulloch played Fett through most of the character's onscreen life. When he missed filming for a single day, stuntman John Morton filled in, while Jason Wingreen provided his voice. For the special editions, he was later dubbed by Temuera Morrison, the actor who played Jango Fett in the prequels. 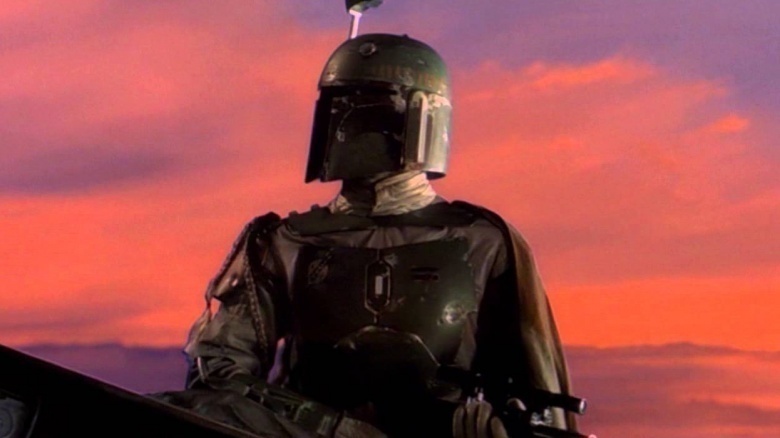 On the subject of the special editions, George Lucas needed more Fett footage, but they decided that flying Bulloch in would be a waste of money. Instead they just used various Industrial Light and Magic employees who could fit into the armor. Mark Austin, a creature animator, Don Bies, a model maker, and Nelson Hall, the assistant manager of the model shop all took on Fett duties. Finally, for the prequels, we got to meet Little Boba who was played by Daniel Logan. Logan also provides the voice for Boba Fett in the Clone Wars cartoon. Nowadays, when Star Wars has an action figure controversy, it usually revolves around the representation of women: depending on who you talk to, Star Wars either shows too much (when it comes to numerous representations of the gold-bikini Leia Organa) or too little (when it comes to alleged shortages of Rey figures on the shelves). 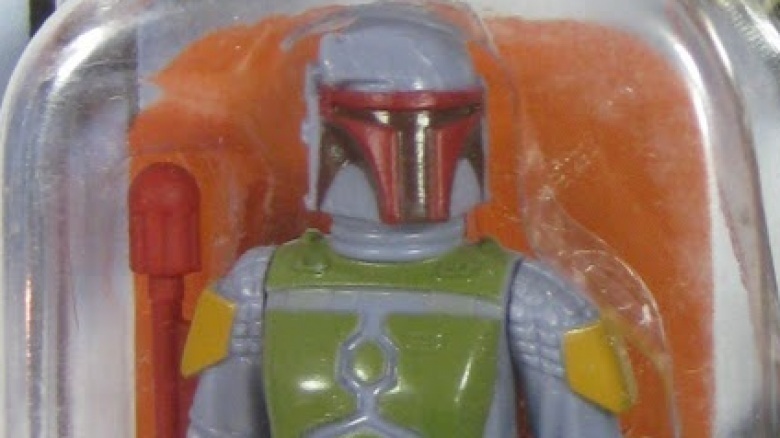 However, the original Star Wars action figure controversy not only concerned Boba Fett, but how most older fans first found out about the mysterious bounty hunter. While some Star Wars fans may have had the misfortune of seeing Fett on the legendarily awful Star Wars Holiday Special in 1978 (something so bad that George Lucas never released it on video, but still subjected us to Droids cartoons and freaking Ewoks specials), most found out about Fett when he was a heavily advertised mail-away action figure released in 1980, obtained by mailing in proofs of purchase of four other Star Wars figures. So far, so good. Just one small problem: in all of that advertising, the Fett figure was portrayed with a rocket-firing backpack. 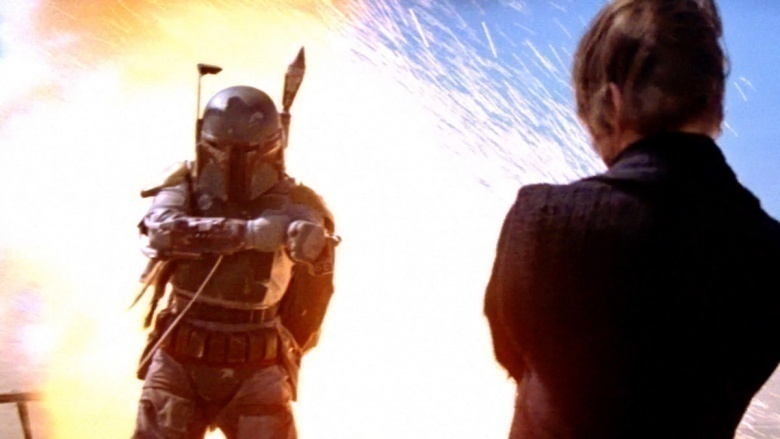 Despite the fact that the movie Boba Fett never fired that rocket, fans were understandably quite upset at not receiving the firing Fett they were promised. Kenner claimed they removed the feature for safety reasons but went on to produce some prototypes of these figures, which have been described as "The Holy Grail" of Star Wars collectibles. Hasbro eventually made things right decades later when they released an actual rocket-firing Boba Fett as part of their Vintage Collection. He, too, was a mail-away figure, and as Vader might say, the circle was now complete. You can tell by looking at Fett that he's pretty well-armored and carries a lot of gear. His go to weapon of choice is an EE-3 carbine rifle. Also close at hand are a disruptor pistol and a concussion grenade launcher. Then there's the flamethrower, dart launcher, fiber-cord wrist launcher gauntlet, vibro-blades, concussive rocket and a jet pack. Fett's helmet allows for full 360-degree vision. It interfaces with his ship's computer, provides water, can seal for changes in atmospheric pressure, record video and amplify sound. The armor itself is designed to resist the elements and minimize impact from anything including blaster fire, while the gauntlets are decked out with a host of different types of rockets, most of which are meant to stun rather than kill, since a bounty hunter can't get paid if he blows up his prey. Of course most of this never made it onto film and, realistically, Fett did almost nothing in the original trilogy beyond looking pretty cool and then selling Han Solo down the river to Jabba. But it was a love of the character's potential that inspired writers in the Expanded Universe to flesh him out, which hopefully will find its way into Fett's solo film. This is a small, but interesting, detail that comes from the Dark Horse Star Wars comics. Boba Fett is apparently very fond of naming his ships Slave; so fond, in fact, that when we first meet him onscreen, he's flying the imaginatively named Slave IV, which is the same type of vessel as his clone dad Jango's original ride, Jaster's Revenge. Those other Slaves have some interesting stories attached, too: Slave II was pulled into duty because his original was impounded, and Slave III was used for helping Fett retrieve ships and other massive cargo. The release of the Special Editions of the Star Wars movies inspired a decidedly mixed reaction among fans. For younger moviegoers, this was their first opportunity to see the original trilogy in theaters. At the same time, though, they had to suffer through all the changes George Lucas added. Some of the changes were understandable and even necessary, cleaning up shots that suffered from the guerrilla filmmaking approach to Star Wars (such as the Vaseline smeared on a camera lens to achieve the original floating speeder effect). However, others ranged from gratuitous, such as adding new floating droids that distracted from iconic scenes, all the way to the outrageous: Greedo trying to shoot Han Solo first, complete with an edited laser dodge from Han that came straight out of the Matrix. Boba Fett's added material, however, is one of the worst parts of the Special Editions. The first new Fett footage was added to A New Hope, in the added scene with Jabba the Hutt. It was filmed for the original movie using a very human Jabba, and Lucas used his CGI magic to put the scene back in with the space slug audiences know and love. Boba Fett was digitally added, but had no interaction with Solo because the character didn't exist when it was filmed; this was just Lucas throwing out a gratuitous glimpse. 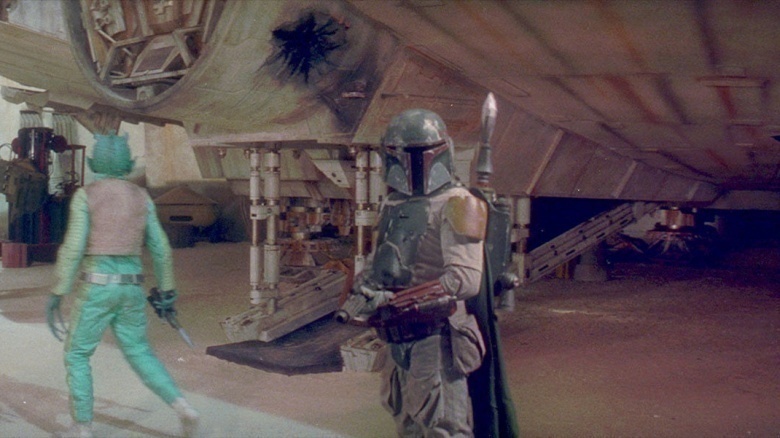 No changes were made to Empire Strikes Back when it comes to Fett, but in Return of the Jedi, there are now scenes of Fett leering at Jabba's dancers and playfully touching a dancer on the chin as he walks out. What's wrong with this, you ask? A large part of what made Boba Fett scary was that he seemed to have no human weaknesses or vices, just a relentless dedication to his goal. In fact, the only excess he seems given to is a propensity for disintegrating his enemies, which Vader chides him for. Now, the Special Editions present him just like any other guy, distracted by the beautiful women around him. While this does open the door for fan theories about his getting knocked into the Sarlacc because he was distracted by Leia's gold bikini, it also reveals that years after Lucas was surprised at the fan love for the character, he still didn't truly understand what made the aloof bounty hunter so cool in the first place. The actual history of the Mandalorians has been something of a moving target in Star Wars fandom. This is because it seems that no sooner than some cool history and backstory is laid out in a novel or comic, a movie or cartoon episode will quickly nullify it. One interesting bit of Mandalorian history, though, is that Boba Fett eventually becomes their leader, a person known by the title "Mandalore." He gained this status through a bizarre tale in which he was hired to kill the existing Mandalorian leader, but only did so as an act of mercy. That leader, Shysa, saved Fett's life on the planet Shogun but was mortally wounded in the process. 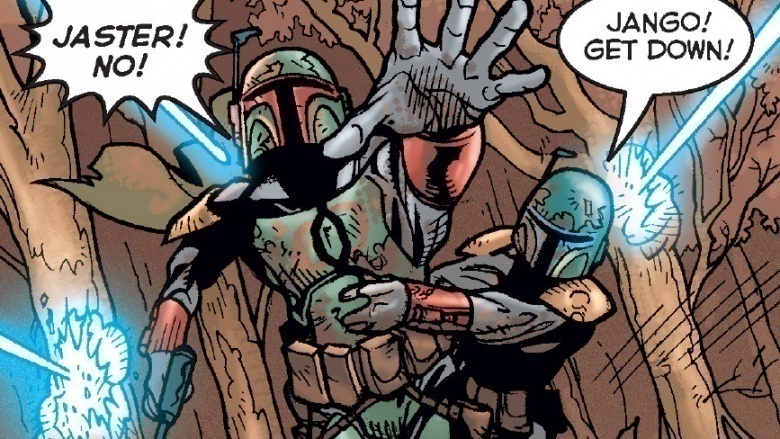 Fett killed Shysa to provide a quick and honorable death, but he was also bound to honor his last request: that Boba Fett become the new Mandalore. The position did not include day-to-day administration, but it did require general leadership, especially in times of crisis. As such, Fett helped Mandalorians fight back against the alien Yuuzhan Vong invaders. He later helped economically restore Mandalore by recalling the various scattered clans to a central location and aiding them in locating a valuable new mineral with which they could regain strength after losing many of their warriors and resources fighting the Vong. 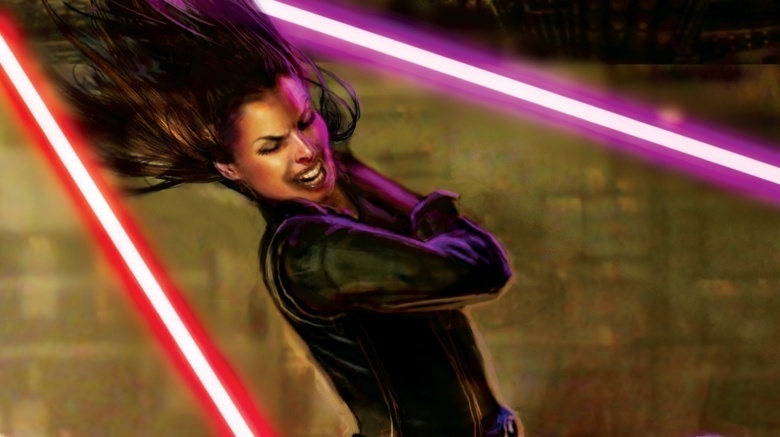 One of the more interesting Boba Fett stories is now less likely than ever to make it to the big screen because it involves the daughter of Han and Leia: Jaina Solo. In the Star Wars novels, Han and Leia had twins, Jacen and Jaina, and a younger son, Anakin. Eventually, Jacen Solo turns to the Dark Side and takes up the name of Darth Caedus. Realizing that she doesn't know anything about hunting, fighting, or killing Jedi, Jaina turns to a much older Boba Fett for training. With the help of Fett and others, Jaina is able to kill Jacen and restore peace to the galaxy. This story also gave Fett an interesting overall story arc, as without his long and storied history of killing Jedi, the galaxy would have been thrust into darkness forever. Let's get this taken care of right away: Boba Fett didn't die. Technically. 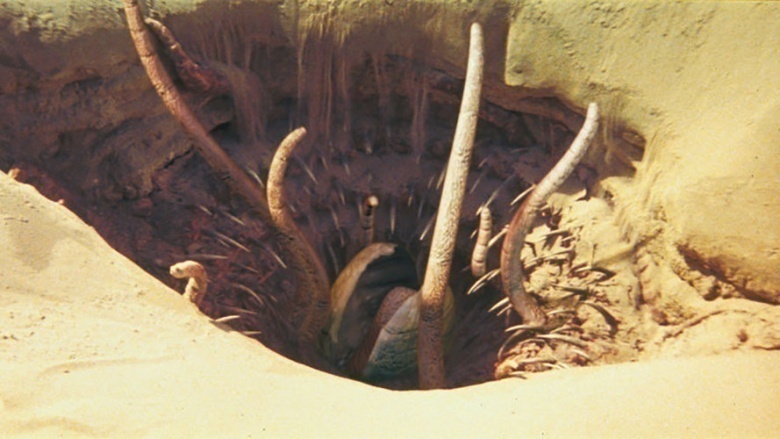 While Fett unceremoniously tumbles into the Sarlacc at the end of Return of the Jedi, later writers would tweak this in the Expanded Universe (which doesn't count in continuity anymore) so that Fett climbed right back out of that hungry sandhole. 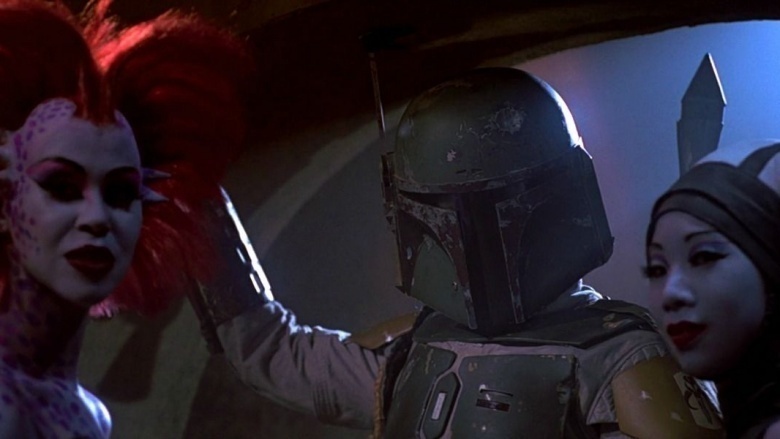 The actor who portrayed Fett at the time wasn't even working from a script, he'd simply be handed his scenes the day of filming, and he felt that Fett deserved better than a hole in the middle of a sand trap. Even George Lucas himself, after realizing how popular the character was, wished he'd given him a more monumental sendoff. For what it's worth, in The Force Awakens, the flags at Maz Katana's include one bearing the symbol of the Mandalorians that Fett wears on armor: a skull that's said to represent the Mandalorian Mythosaur, a city-sized reptile that existed long ago. 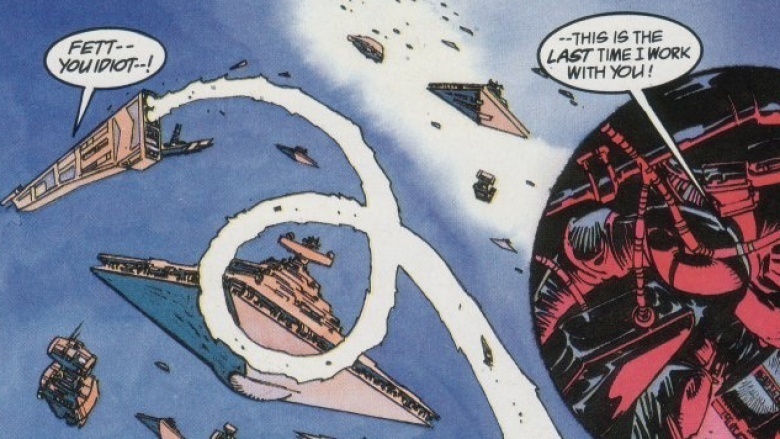 If Fett was the last person ever to use this symbol, does that mean he's still alive and a patron of Kanata's? Maybe we'll find out later.